If it's true that April will see the opening of a MARC by Marc Jacobs store in London then I hope that it's filled with gorgeous goodies like these riding boots. 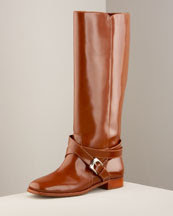 These are the kind of boots that every wardrobe should have. Practical, gorgeous and versatile. And they're the kind of boots that will improve with age providing they're lavished with the love they deserve. And at a [bigger] purse [than mine] friendly $298 down from $595 (£200 from £400), there's no reason not to want and have them.